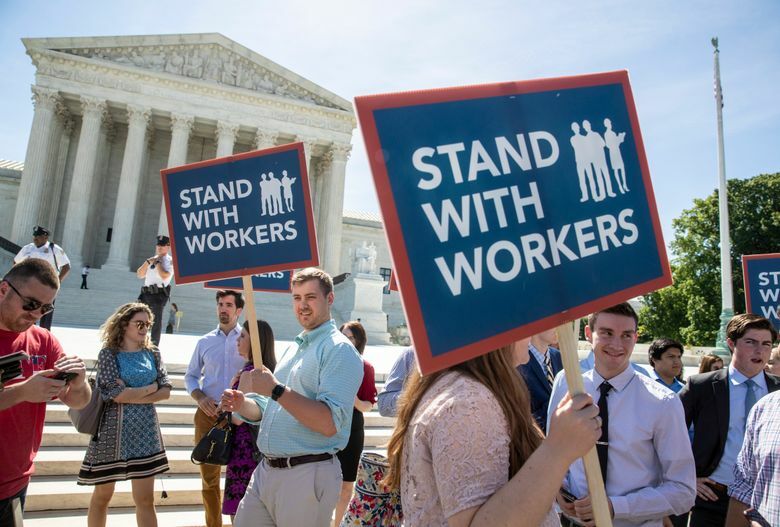 Public-sector unions had been preparing for the ruling at least since the conservative-leaning high court decided in September to take the case. Before Neil Gorsuch was confirmed, the court had deadlocked on a similar case, with the four conservative justices ruling against unions. Ryan Yohn, an eighth-grade American history teacher in Westminster, California, said there are educators who believe it is unjust to be forced to pay into a system that supports political ideologies they do not back. Yohn sued the California Teachers Association last year to opt out of mandatory union membership. With the successful organizing unions did in anticipation of the Janus decision, there is a strong chance many may be able to offset some loss of members, said William Herbert, executive director of the National Center for the Study of Collective Bargaining in Higher Education and the Professions at Hunter College. Experts look to Michigan and Wisconsin to show how curtailing the power of public-sector unions can shift political winds. In Wisconsin, Gov. Scott Walker, R, and a GOP-led statehouse in 2011 sought to solve the state’s budget crisis by undercutting public-sector unions, limiting their ability to collectively bargain and eliminating their ability to collect agency fees. Michigan enacted similar reforms in 2012. “It undermined the unions’ ability to engage in politics with the diminished staff, with diminished resources. It had a very significant impact in the political direction,” Wong said. Both states, which had previously backed President Barack Obama, helped deliver victory to President Donald Trump. Wong points squarely at those states’ efforts to undercut unions. Teacher unions have campaigned against school-choice policies, private school vouchers and efforts to expand charter schools. The California Teachers Association donated $1 million to the gubernatorial campaign of Lt. Gov. Gavin Newsom, D, and endorsed him in the primary after he said he did not want to increase charter schools in the state. Newsom garnered the most votes in the primary. Former Los Angeles Mayor Antonio Villaraigosa, D, who received millions of dollars in donations from charter school supporters, finished a distant third in the primary.